We’ll be playing at Comet Club, Berlin on August 9th, 2013. It’s a friday night at Kreuzberg’s night life scene next to Watergate and Magnet Club. Doors open at 10pm, live acts are scheduled until about 3am and the party is expected to go into late morning. 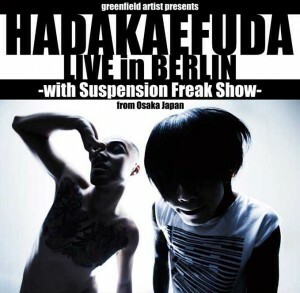 Headliners are going to be Hadakaefuda from Osaka, Japan, together with a Suspension Freak Show by Berlin based team RoBodMod. They will be backed by Strange Fluid and Wou Masta, who will straighten out the way for our drum’n’bass show once again with his massive dubstep beats. The after show party will feature drum’n’bass at it’s best and begin with japanese Djs Masukaitenero and Supa 8 Bit, followed by Berlin residents Uumm and HNS performing back-to-back. The Comet Club is located at Falckensteinstr. 47, 10997 Berlin. The live part starts at 11pm, entry is 10 Euros. The party will start around 3am, entry is 5 Euros then. Take away a Flyer here. This entry was posted in Announcements, Live, Music and tagged Concert, Live by Strange Fluid. Bookmark the permalink.